It is not too long ago that encounters between these two sides represented the apex of English football - relentless attacking play, all-out aggression but above all else, quality. Manchester United and Arsenal set the standard. What, then, to make of this - a chaotic 2-2 draw that was defined by two teams in transition, profiting from each other's mistakes? Nobody ever expected the late 1990s to early 2000s peak from this 2018 edition, though it demonstrated how far both sides have to go to reach those heights. For the first time since the summer of 1986, neither Alex Ferguson nor Arsene Wenger were watching this fixture from one of the two dugouts, allowing us to simultaneously take in two very different re-builds. Arsenal's under Unai Emery is only a few months old and yet sound foundations have seemingly been laid. United's, five years down the line, is struggling to get off the ground. If the post-Ferguson Manchester United was an episode of 'Grand Designs', this is the point where the kitchen is flooded, the staircase does not fit and Kevin McCloud is asking why three costly water features are sat in the garage collecting dust. Jose Mourinho dropped Paul Pogba and Romelu Lukaku, the two most expensive signings in United's history, to the substitutes' bench. Fred, the fifth-most expensive, was not included in the matchday squad. Mourinho cited "technical and tactical" reasons for his decisions on Pogba and Lukaku. A line in his programme notes seemed more telling. "There isn't space for people that are not ready to give their all," he wrote. In their place came the likes of Matteo Darmian, making only his third league start of the season, although he was a relative veteran of the campaign by this line-up's standards. Diogo Dalot was making only his second league appearance, while it was Marco Rojo's first outing of any kind this season. Mourinho asked for 'mad dogs' after the draw at Southampton and Rojo perhaps embodied this madness more than any other one of his charges, whether it was grabbing Pierre-Emerick Aubameyang by his ankles to bring him down or slide-tackling Matteo Guendouzi for having the temerity to block his goal-bound shot. Yet 'madness' is a double-edged sword, and demanding it from a limited set of players carries attendant risks. Rojo played every minute with blood rushing to his head and paid the price midway through the second half. When his miscontrol allowed Henrikh Mkhitaryan to dispossess him, he tried to make amends by tackling Alexandre Lacazette, only to divert Lacazette's attempt into his own net to put Arsenal 2-1 up. It was a moment symbolic of the game's general sloppiness. Rojo was not the only guilty party. 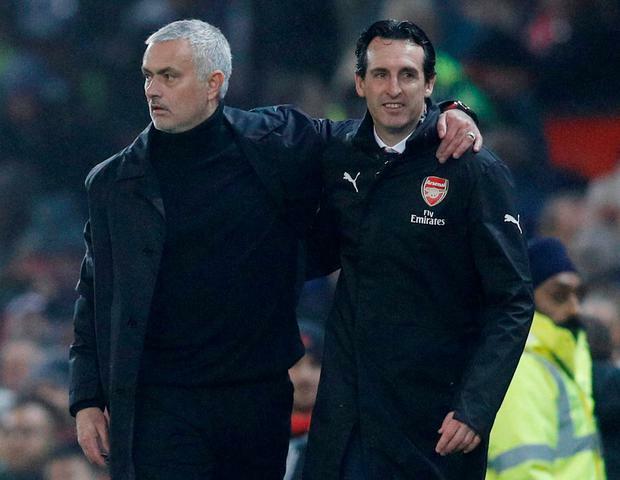 Arsenal, for example, immediately allowed United back in, conceding from the kick-off due to a collective defensive failure which allowed Jesse Lingard to level. Even David de Gea's night did not go unblemished. De Gea, usually so composed, had gifted Arsenal their first by applying his own spin to the 'Jordan Pickford', palming Shkodran Mustafi's downward header into the air and over his own goal-line. For Arsenal, the errors and imprecise play will be passed off as teething problems post-Wenger, especially after Sunday's victory in the north London derby offered so much promise about the future under Emery. Yet for United, five years on from losing their own 'great man of football', two-and-a-half years into Mourinho's regime, the question is whether these creases will ever be ironed out. Like against Newcastle, Chelsea, Bournemouth and at Southampton this weekend just gone, they needed to go behind before coming back to offer a response, as though adversity is now part of their game, as if they need to go 1-0 down to get going.